Our custom harnesses are designed to simplify your vehicle wiring. 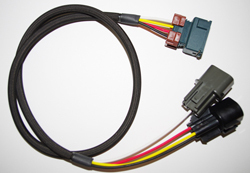 They are made with automotive grade wiring, OEM connectors and terminals, and quality construction material/methods that meet or exceed OEM spec. The goal is simple: buy our product, install it, then not have to think about it again. PN#HAR-1G2G95 This harness will adapt a 1G CAS into a 95-96 DSM, perfect for 1G engine swaps. It connects at the CAS, and then plugs into the 2G cam and crank sensor connectors. Want this item shipped out tomorrow, April 19? Order within the next 16 hrs 37 mins.